[174 Pages Report] The global connected rail market is driven by the need of safety and security in railways, growing economy, increase in population, government norms, and growing urbanization. New infrastructure development, technology shift, ongoing rail projects and upcoming rail projects have fuelled the demand for connected technologies across the globe in railway industry. 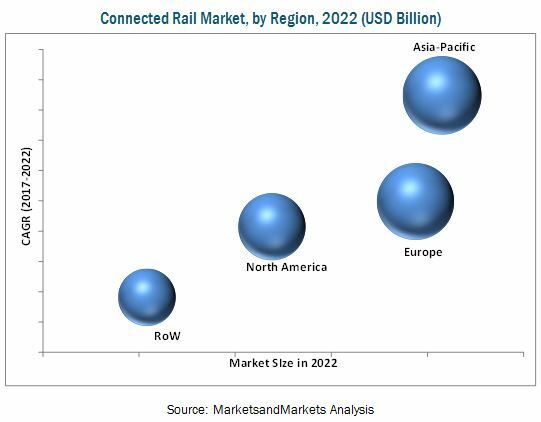 Global connected rail market is estimated to be USD 77.27 Billion units in 2017 and is projected to grow at a CAGR of 6.42% during the forecast period. The base year for the study is 2016, and the forecast period is from 2017 to 2022. The objective of the study is to define, describe, and provide a detailed analysis on connected rail technology used in the rail industry. 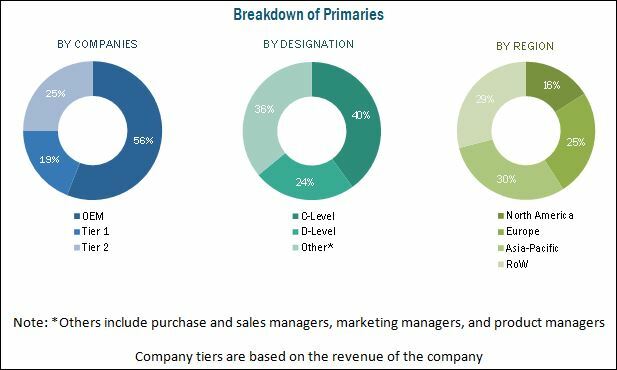 The report segments the market by connected service, by rolling stock, by safety and signaling system, and by region. The primary aim of the research study is to provide in depth analysis of the global connected rail market and detailed analysis of the dynamics driving this market. A detailed study of various market leaders has been done and opportunity analysis has been provided in the report. Various secondary sources, such as company annual reports/presentations, press releases, industry association publications such as The European Rail Industry (UNIFE), International Union of Railways, Federal Railroad Administration, Association of American Railroads, International Association of Railway Operation Research etc., railway magazine articles, directories, technical handbooks, world economic outlook, trade websites, technical articles, and databases (Marklines, Factiva etc.) have been used to identify and collect information useful for an extensive commercial study of the global connected rail market. The primary sources experts from related industries, railway manufacturers and rail components and technology manufacturers have been interviewed to obtain and verify critical information, as well as to assess future prospects and market estimations. The top–down approach has been used for market estimation and calculating the size of the connected rail market. The ecosystem of the connected rail industry consists of manufacturers such as Bombardier Inc. (Canada), Alstom SA (France), Siemens AG (Germany), Hitachi Limited (Japan), Robert Bosch GmbH (Germany), Huawei (China), Cisco Systems Inc. (U.S.), Wabtec Corporation (U.S.), Nokia Corp. (Finland) etc. The connected rail market, in terms of value, is projected to grow at a CAGR of 6.42% from 2017 to 2022. The connected rail market is estimated to be USD 77.27 Billion in 2017 and is projected to reach USD 105.44 Billion by 2022. This increase is triggered by various factors, which covers various aspects, like need for safety and security, be connected while traveling, government regulations, increase in population, growing urbanization etc. which leads to demand for high-end technology that results in increase in demand of connected rail. The report segments the market for connected rail based on rail services type. The connected rail, based on rail services type has been segmented into passenger mobility & services, passenger information system, train tracking & monitoring solutions, automated fare collection system, IP video surveillance, predictive maintenance and among the others. Further connected rail segmented into by rolling stock, the segment includes diesel locomotive, electric locomotive, DMU, EMU, light rail/tram car, subway/metro vehicle, passenger coach and freight wagon. The connected rail again segmented by connected safety & signaling system, includes positive train control, communication/computer based train control and automatic/integrated train control. By region (Asia-Pacific, Europe, North America, and ROW), as these are emerging technology market which will propel the overall growth of this market. Nevertheless, few technologies are already taking place in the market, as it is already a growing market, which shows a decent compound annual growth rate during the forecast period. The CBTC segment is estimated to account for the largest market share, in safety and signaling connected rail market, in terms of value, in 2017, whereas, predictive maintenance segment accounts for the largest market share, in connected service connected rail market in terms of value, in 2017. The freight wagon segment is estimated to account for the largest market share, in rolling stock connected rail market, in terms of value, in 2017. The rolling stock leads the overall market, the second largest in the segment are connected services with largest market share, in terms of value, in 2017, followed by safety and signaling system segment which is the third largest segment of overall connected rail market in 2017. The Europe region is estimated to dominate the connected rail market, in terms of value, in 2017, as it comprises some of the technology innovator country in the world, including Germany, U.K., France, and others. This has led to an increase in connected rail value in recent years, with rail manufacturers and rail technology innovators catering not only to the domestic demand but also to overseas demand as well. Moreover, the region going to lead the market in terms of value, due to major rolling stock manufacturers and technology innovative players like, Alstom S.A., Bombardier, Atos, Bosch and among others are innovating new technology day by day in order to meet the regulatory norms and customer satisfaction. The market is going to be led by the Asia-Pacific region in 2022, due to increase in population, growing economy, and increase in rail projects. One of the restraining factors of connected rail technology is the higher installation cost of numerous rail signaling systems and connected rail various services such as passenger information system, automated fare collection system etc. The rail and technology manufacturers are working on to reduce the installation cost by undergoing agreement with regional governments and country specific governments. These agreements will power them with subsidies and other benefits, which will help manufacturers to reduce the overall installation cost.